Over the last week, my father and I built 3 Earthtainer III systems, very easy to build. 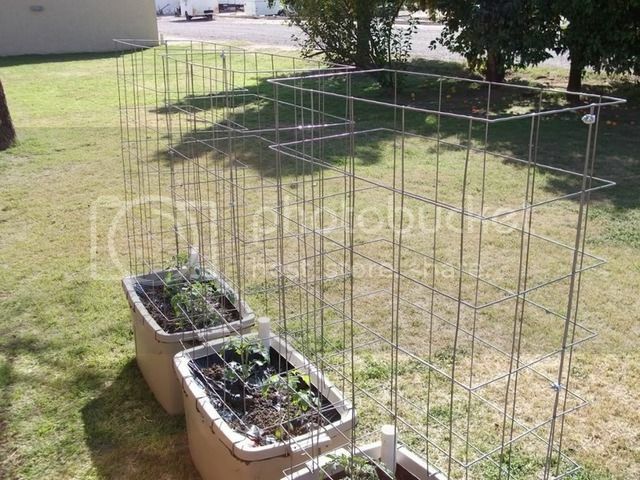 we then constructed 3 tomato cages to go around them. Instead of using pea fence as the instructions said, we used 4'x7' concrete mesh and bent it using a metal brake that we have. After bending the base as per the instructions, they fit perfect, no sharp corners, only used 3 clamps and very strong. We planted 6 tomato plants, two of each kind, Pink Girl, Big Boy and Cherry tomato. We will see how they grow, I know this, they were planted on 2/28/11 and they have grown about 1 inch and started putting out flower buds. Here is a pic or two of the systems. Looking Good!! I am still contemplating re-building my Earthtainer II's into the III style cages. I assume you had to re-jigger the bend points as the Pea Fence cages use 7" spacing, and I believe your CRW has 6" wire spacing. It looks like you did get the vertical legs to align perfectly where you joined them with the 3 wire rope clips. What size Brake did you use, and is it something affordable that someone who wanted to build say, 10 of them could justify financially? This is what we did, The mesh is 6" square and that is the width of the handles, so there is one vertical rod on each side of the handle. Make one short side even as there might be excess wire, measure 10" and mark the bend point, mark the rest before you bend, 38", 52", and 80 inches. After marking the 80" point you should have 4" before the last vertical rod that will go on one side of the handle. This is the Steel Remesh that we used, it says it is 7'x3.5' but it measures 4' they are about $8 each. We used a break like this one from Grizzly Tools. Possibly using a heavier angle iron as the rods in the mesh are a bit heavier. We still used the pipe to bend the rods that sit on the container. With this it kept everything smooth and less likely to scratch anyone reaching into the plant to pick fruit. Last edited by drallred; March 3, 2011 at 08:57 PM. That $75 home spun brake looks more realistic for most folks! 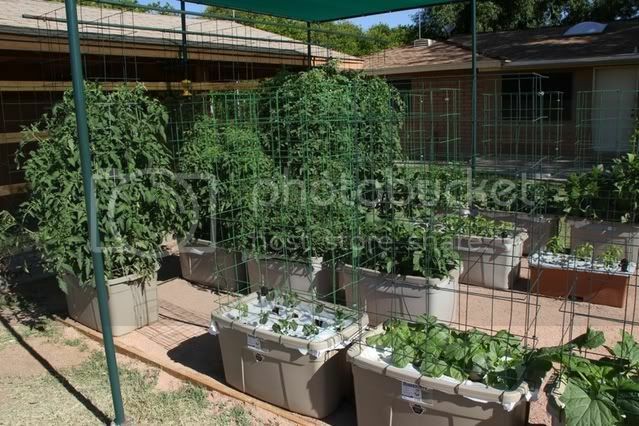 (Photo taken on July 2, 2010) Your tomatoes will climb well over the tops of your current 4 foot high cages in no time. 2). Those are mighty beautiful looking cages now. But come one year from today, they will be all rusted and terrible looking. ASAP, I would take the cages off the EarthTainers, prime them, and paint them with clear-coat, or other finish that will properly adhere to the surface of the CRW. You could even have some "fun" painting them in different colors! Maybe an Auto Body Shop could do them up for you. Bending brakes are commonly available from rental companies, too. I rented one a few years back and it cost me about $75 for the weekend. That is even a BETTER idea, as most of us homeowners would likely not use a Brake again for another 5 years. There have been "community" type machine shops open for business in our area where you can take your project in and essentially "rent" time on the equipment at an hourly rate to do it yourself. For seldom used tooling, this would seem to be a good option as well. 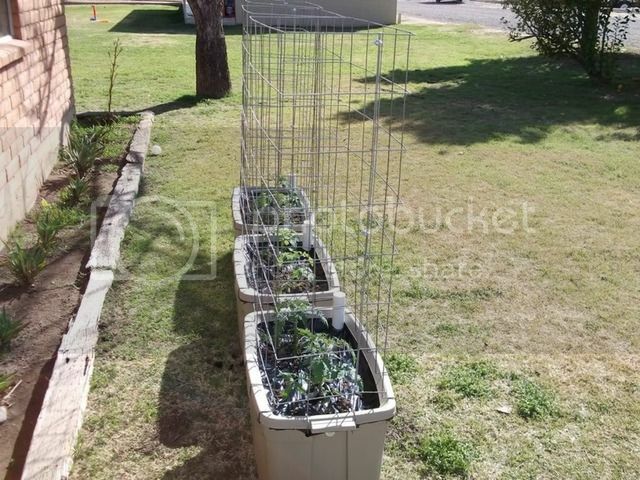 Here is an update of the garden, it now has 15 Earthtainers and 1 Earthbox. Here are a few pictures that were taken today. The tomatoes are growing very well, only one of the Better Boy plants is having issues with Blossom End Rot, still trying to figure out how to solve that. 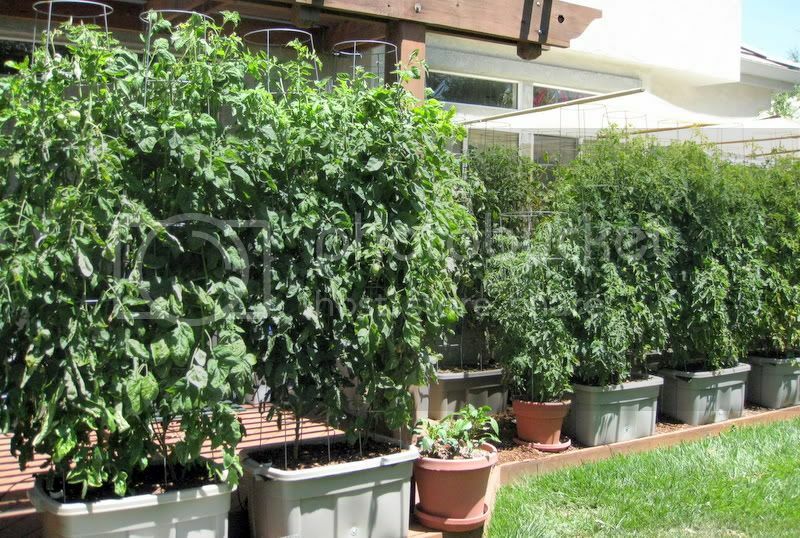 The list of plants are as follows, tomatoes: Big Boy, Sweet 100 cherries, Cherokee Purple, Black Russian, and Pink Girl. Okra, Egg plant, Yellow Crookneck Squash, Blue lake beans, Red and Purple bell peppers, Hatch Chilies, 6 different herbs, and Tomatillos 2 types. The shade is used for the hottest part of the day and makes a big difference. We are using Automatic watering system from Earth box, makes it really simple to take care of the plants. Now lets see if the garden will withstand the Phoenix heat in the summer, so far it has been mild outside and the plants are just loving it. Last edited by drallred; May 3, 2011 at 05:28 AM. Especially this time of year in Phoenix. Can I ask you a favor and save your pictures in Picasa to an 800 dpi file to post. It took my PC 15 minutes to download your high resolution photos, which is not good for most folks here on Tomatoville. p.s. It looks like you've taken the rust-prone CRF cages and painted them green. Congrats!! 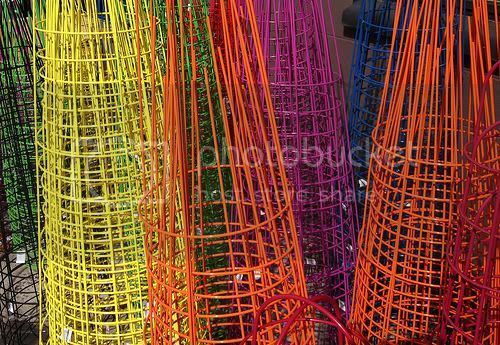 also, you seem to have a few extended cages - - how did you fasten them together? I am totally jealous. 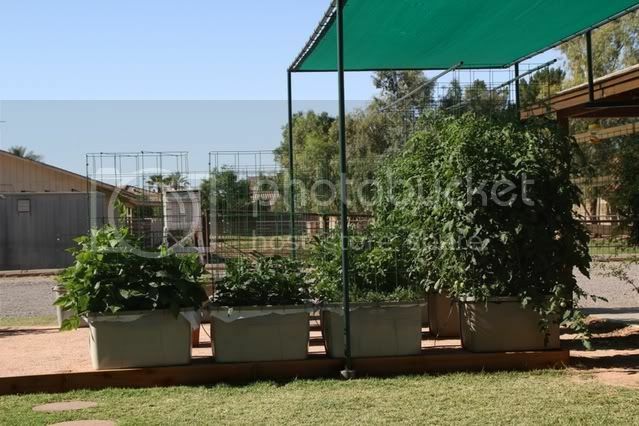 My garden here in Chandler doesn't look anywhere near as good as yours. You did a great job on the cages, too. The weather has been perfect for gardening so far. It hasn't been really hot yet. Is the white plastic you're using just a kitchen trash bag or did you get white plastic sheeting from somewhere? Brian, the white plastic sheets are from the bags of potting mix we purchased, they are thicker and white on the inside. Raybo, the cages are painted green and we made extensions and we are using cable clamps to hold them together. I'll see if we can get a better picture for the cages to post, hard to see just wire and make it look good. Wow, outstanding job and results! BER is more problematic in some varieties than others. If you search the posts last summer, I was having a tough fight with BER, and Ray, Ami and others gave some outstanding advice that worked that you may want to try. One, shade the base of the tainer with a bamboo shade (or anything you may have handy) to keep direct sun off of it. These were E.T.II's and the IIIs may not have that problem as they are double walled. Along those lines, I also got the tainers off of the concrete with 2x4s to help with root overheating as well. Too much heat on the roots may have interfered with calcium uptake, which seems to contribute to BER. Second, when you water, use a liquid feed with lots of calcium, available at local hydroponic stores. One or both of these "fixes" resulted in complete elimination of BER. Good luck. Can't wait to see the bountiful harvest that is coming your way! I recommend using a kitchen trash compactor bag. They are typically 2 or 2.5 mil. If you just cut the bottom and one side, you can use the whole bag and shade the sides of the container. Mine last all summer. Using your compactor bags is an excellent suggestion to shade the exposed sides of the EarthTainer. Well done!